Japanese Tan Tan Noodles is a fusion recipe marrying Chinese Sichuan flavors with Japanese flavors. The mix of flavors gives Tan Tan Noodle Soup a complex deliciousness. One day last month, I had leftover beef bone broth which I made with my pressure cooker for Vietnamese Spicy Beef Noodle Soup.. I decided to add beef bone broth in place of the broth I usually use to make Tan Tan Noodle Soup…. The results were amazing! Strong bone broth flavors underlying the sesame and soybean flavors of the usual Tan Tan Noodles. If you're a fan of strong flavors, I think you'll love this mix! Beef Bone Broth is easy to make. Boil some beef shank bones with half an onion, some ginger, garlic and bay leaves in a pressure cooker (or stove top if you don't have a pressure cooker). Pressure cooker shortens the cook time. I like to boil the bone until all of the tendon and meat comes off the bone, usually about 90 minutes with my pressure cooker on high. I would boil it for double that time stove top. Best to cook it the day before to allow the broth to cool overnight before using it, so that you can remove any excess fat easily. 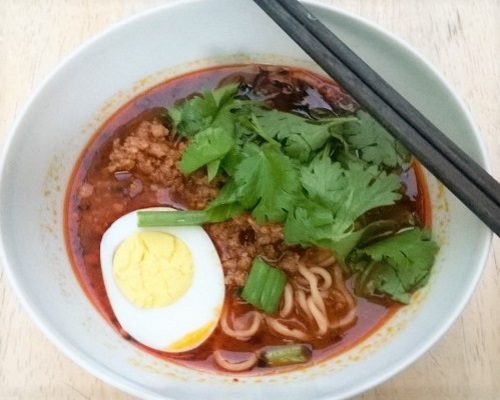 If you prefer to do without the sesame paste of Tan Tan Noodles, try it with Sichuan Hot Chili Oil and soybean paste for a slightly different flavor. Or have it plain with a little salt. This dish works perfectly on a cold winter's day. It does a great job warming up from the inside. Spicy, rich, sweet and salty, the many layers of flavors goes perfectly with a simple boiled egg and some blanched greens. This recipe yields about 6 bowls of noodle soup. If time is a limiting factor, feel free to substitute with dry garlic, onion and ginger powders. I recently updated this recipe using soybean paste instead of hot bean paste, since it would be easier to adjust the heat according to taste. I use homemade Sichuan Chili Oil to add heat, both while cooking and in the bowl.